Head off for a mesmerizing railway journey as you board on the Ooty to Coonoor Toy Train. The almost nostalgic toy train gives visitors a revitalizing travel experience moving through lush green tea estates, thick forests, tall eucalyptus trees and lofty mountains. Covering a distance of 19 kms the Ooty to Coonoor route offers the most spectacular scenery along its way. The journey is slow and gives you ample opportunity to discover nature’s bounties. The short ride of 3 hours takes you through an enlivening excursion where you get immersed in the beauty of the quaint place. Meandering through tunnels and crossing the bridges the journey trails you back in time. 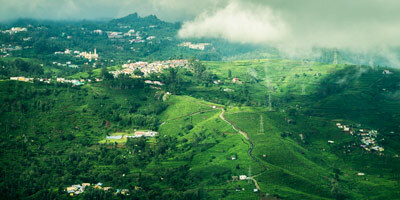 Ooty is a hilly paradise surrounded by breathtaking forests, lakes, gardens and waterfalls. The mountain railway ride weaving through beautiful valleys, serene lakes and rolling hills makes your trip to the most popular hill station more enticing. The Nilgiri Mountain Railways built by Britishers seeking a hilly retreat, has been connecting people of the hills to the plains. The meter gauge railway line recognised as World Heritage Site by UNESCO provides an enchanting railway journey experience you would cherish forever. It is an outstanding example of the engineering and technical works involved in establishing the railway service through the jagged mountainous terrain. The steam locomotives are replaced by diesel locomotives between Coonoor to Udagamandalam route. It is the steepest rack in Asia with a gradient of 8.33%. Indian Railways runs two trains from Ooty to Coonoor. The 56137 Udagamandalam to Mettupalayam train departs from Ooty at 14:00 hours and reaches Coonoor at 15:05 hours. The 56139 Udagamandalam to Coonoor train leaves Ooty station at 9.15 am and reaches Coonoor at 10.25 am. Tickets to aboard the marvellous toy train could be booked online through Indian Railways website www.irctc.co.in or you can get it from the ticket counters at the station. Tourists visiting Ooty have a quest to travel through the legendary train, as such there is a huge demand for the tickets and it is highly recommended that you book your tickets online 2-3 months in advance. Be sure that you get onto the train a little early and sit on the seat near the window to quench your thirst for getting soaked in the inspiring beauty of the landscape. Operating for more than a century now the great toy train still radiates the same charm that it did in 1908.